So finally the Night Witch is available in the Clash Royale Arena! It’s time to test out the best decks with her! The Night Witch is unlocked from Arena 8 (or Frozen Peak). She is a single-target melee troop. Pretty similar to Witch, she summons 2 Bats (instead of Skeletons) every 5 seconds. Upon death, she spawns 4 Bats (similar to Golem or Lava Hound). 12/6/17, decreased the Night Witch’s Bats spawned upon death by 1 (to 3 from 4), increased Bat spawn speed by 1 sec (to 6 seconds from 5 seconds), and initial Bats spawn slower. 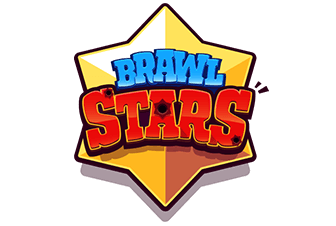 On 11/8/17, decreased the Night Witch’s damage by 9%, her range by 11% (to 1.65 from 1.85), her Bat spawn speed by 1 second (to 7 seconds from 6 seconds) and the number of Bats spawned on death by 1 (to 2 from 3). On 24/1/2018, made the Night Witch’s initial Bats spawn faster but also decreased her Bats’ hit speed to 1.1 seconds (from 1 second). Since the Night Witch is single-target melee troop summoning flying units, you just can’t simply use her instead of the regular Witch in most cases. Comparing to the Witch, at Tournament standard, she has pretty similar stats for 1 less Elixir. She is better on offense but worse on defense. She can’t deal with most ground troops which you could counter with the Witch. She can’t use the Bats to distract ground-targeting units. The Night Witch can solo kill a Tower. Yes! She can kill the entire tower before she dies. She would spawn up to 12 Bats before she dies. Night Witch’s hard counter would be Lightning, Rocket, Poison and Fireball. Be ready to deal with the bats once she is killed because they would deal a ton of damage If protected. Archers are very good against her because they can one shot Bats and then take her out easily. In order to deal with a Giant Night Witch push, you need to kill the bat spawner first. Ice Golem is great at dealing with Night Witch as his death damage is enough to kill the Bats at Tournament Standard. 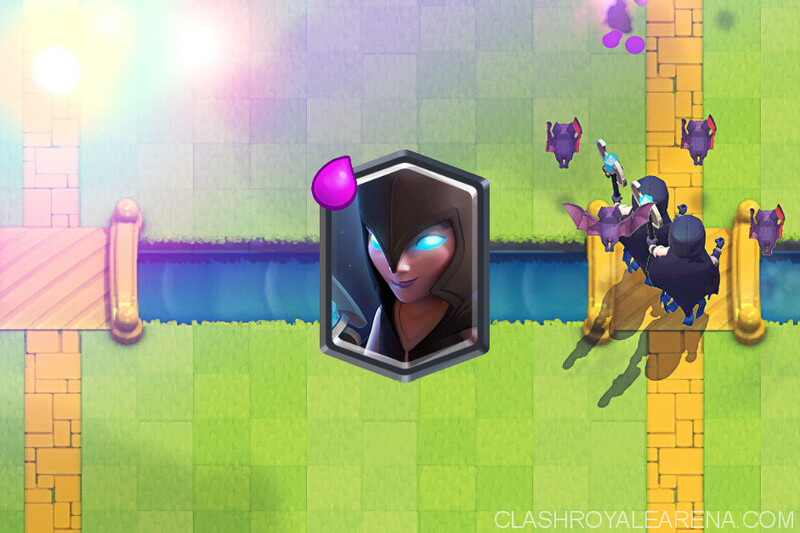 Electro Wizard, Executioner and Tornado are also great at dealing with her on defense. 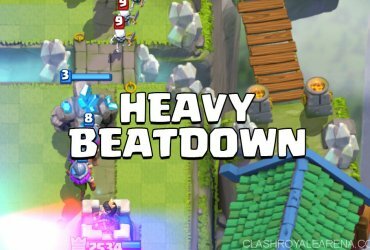 As Night Witch has become rather popular in beatdown decks, Executioner + Tornado has received an indirect buff as the Executioner can splash behind the tank and kill the Night Witch. This combo also keeps the Golem from reaching your tower for a bit longer thus mitigating the damage done. Due to the movement speed, the bats always fly in front of her and will die easily, making her easy to counter. You should think about this while using her. You can use Night Witch in Miner Control Deck! First use her on defense to deal with ground troop. She will act as a meatshield while the Bats are doing damage. 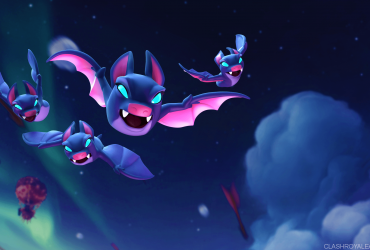 Once died, she spawns 6 more Bats, giving you a great opportunity to counterpush with Miner. If your opponent decides to deal with the Bats first, it would be great for you as countering Bats is usually negative Elixir trade. Night Witch is also pretty good in Graveyard decks. She really does shine in control decks despite beatdown seeming like her archetype. Which is not really the case because of just how effective Executioner Tornado is. Executioner Tornado already is a deadly combo in the popular Hog Lightning deck and this can completely shut down a push in its tracks, allowing your opponent to simply Hog in front of the counter and perhaps even take a tower. Here was able to take the tower after Hogging in front of the Executioner rather easily. I got a +3 trade off that exchange. She is a great counter-attack card. If she dies, your opponent will have to deal with the Bats. If she doesn’t die, she will spawn loads of Bats. Also popular defensive cards like The Log, Knight, Valkyrie etc won’t have a good time stopping the Night Witch because after killing the Night Witch with a tank being focused by the tower, your Bats will kill the Knight and then move onto attack the tower. She fits naturally very well in Beatdown decks either fast or slow. Lumberjack could synergies with the Night Witch very well because his Rage ability would give her Bats a ton of extra damage. Also in decks like Golem beatdown, she can fit into the Lumberjacks slot. Her high DPS actually works better than an LJ because she can shut down a Hog before it gets more than 1 swing off the tower and also her counterpush potential is great. She moves slower as well allowing you time to put something in front of her as well, also because of the Bats she’s more spell resistant. Your opponent would have to Lightning + Zap or Arrows to get rid of the pesky Bats as well for an example. 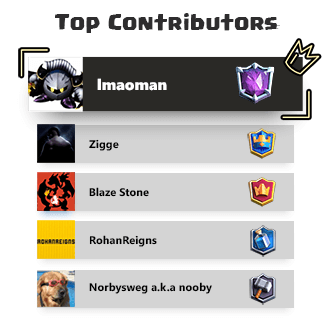 She could work with Lava Hound very well! Her Bats would support the Lava in the air meanwhile her melee attack could help take out Electro Wizard, Musketeer, Executioner etc. Placing her beneath the Lava Hound at the bridge would be a great move If your opponent has Inferno Tower. Because the Bats can act as distractions for the Inferno Tower, similar to Minions, or if you run something like Miner + Lavahound with Night Witch, which has more of a control feel to it, you can simply let the Lavahound and Night Witch die and Miner to tank for them because you want her to die to get the Bats DPS on the tower. She could spawn up to 8 Bats before she hit the river. Meanwhile, Zap can destroy Bats instantly at Tournament Standard so you will want to use one or two zap bait cards like Goblin Gang or Skeleton Army in your deck. This means she could do pretty well in Zap Bait Decks also. The Bats really makes Night Witch deadly! Assuming that your opponent drops the Night Witch at the back and then the Giant right in front of her when she is about to reach the bridge. You could easily use Knight or Mini P.E.K.K.A to kill her but you will need to deal with 8+ Bats right after that. Using Arrows would give you a negative Elixir trade and using Zap is not a positive Elixir trade. Here are some great decks which would be dominating at the moment in the Arena. Now many of you might be facing a lot of Night Witches in Grand Challenges and perhaps even on ladder. Because it’s a new cards your own deck might not be adapted well to handle her. For example, If you’re using something like Golem beatdown that’s easy picking for a Night Witch user because only having the Baby Dragon as a counter card for her Bats. So a few decks that will do well against any and all Night Witch decks will be listed below. Similar to Splashyard you want to keep the Executioner for the Night Witch pushes and Tornado always in cycle as well. Executioner Tornado will deny the Night Witch along with support. What I like to do is, Tornado and Ice spirit together to freeze them together allowing the Executioner longer to splash the clump. Also you need to get a good Executioner placement as well. A good spot is right in front of tower or center if your opponent tends to split push and you want Executioner just in case to be able to reach the other side as well. Poison is very effective vs Night Witch and most decks carrying her do not run many Night Witch counters. Taking the Lavahound Night Witch deck and the Golem Night Witch deck, Poison is the best counter. You can get a free Poison whenever they drop the Night Witch to counter the Graveyard. Poison 1 shots the bats as well allowing you to maximize the damage done to the tower. Using a Poison on defense is fine as well. Poison+ The Log while you keep Night Witch in the poison will deny all Skeles. Also specifically Splashyard. On defense, you want to save your Baby Dragon for a tank + Night Witch push. Vs a lone Night Witch you can easily use a Knight for a +1 trade. Usually Night Witch beatdown has Pumps. If not behind the tower ALWAYS Poison it, if behind the tower then place the Knight a little ways from the bridge, allowing you to build up a few elixir then Graveyard and you will have enough for a Poison. Wait on the Poison, try and always get value rather than simply placing it smack on the elixir collector. You have Princess to splash troops and Inferno Tower, try and get anti Lightning placement. Goblin Barrel can be used to draw out Log, if not you can Skeleton Army to do so. Save your Goblin Gang because it is the only one that has air attacking troops to clean up the bats. Honestly the Princess splash is AMAZING vs these decks, just protect her from miners because if you lose her that can be devastating. Never let your opponent pump up and make good trades in order to make sure your opponent never gets too far ahead in Elixir. Also if you are running the somewhat old Miner, Minion Horde or Mirror Furnace version. Minion Horde does work as well. Mirror is something not many anticipate so make sure your opponent plays to your rotation as you should while playing control decks. You’ve got 2 answers to Pumps and Poison as shown above is just amazing on defense. You have Skeles and Ice Spirit which can kill a night Witch, Knight works well too. Try not to use E-Wiz 1v1 because night Witch does a LOT of damage. Place E-Wiz far from the night Witch similar to how you should place it vs a Battle Ram. Rather than on top and have your E-Wiz die to the barbs. Or this case night Witch. You also have Inferno just in case your opponent runs a beatdown Night Witch deck. Making good Poison plays is how you win this. Because it’s very cheap you can cycle back to Poison REALLY fast. Using these decks you will rather easily be able to deal with the night Witch. That being said later on different decks may emerge as the meta evolves as it usually does to adapt to new cards. You will be able to use these strategies and decks to deal with decks with her later on. What do you think about our new Legendary guys? Please share your opinions!